Lakeland Terrier is an English breed which originated in the Cumberland region in the 1800s. Her ancestors probably include the Border Terrier and the Bedlington Terrier, although experts believe that other terriers may also have been used. Her primary occupation was to hunt the foxes that would prey on the farmer’s sheep during lambing season. The Lakeland Terrier stands 14 to 15 inches tall and weighs between 15 and 17 pounds. Her head is broad and muzzle is strong. The eyes are small, and the ears are folded forward. The body is as long as the dog is tall at the shoulders. The tail is docked and carried erect. The coat is double, with a soft undercoat and a wiry outer coat. Acceptable colors include wheaten, red, liver, and black. This coat requires twice weekly brushing and combing to remove dirt and dead hair and to prevent matting. The coat needs trimming once a month. Potential owners should discuss coat care and grooming needs with a breeder prior to purchasing a Lakeland Terrier. The Lakeland Terrier is an active dog breed and needs daily exercise. Although a Lakeland Terrier will have fun on walks, she will also enjoy jogging, playing flyball, and training on the agility course. These dogs are busy and, if left alone too long, will find ways to amuse themselves. All exercise should be on leash or inside a fenced yard, as these dogs are instinctive hunters and love a good chase. 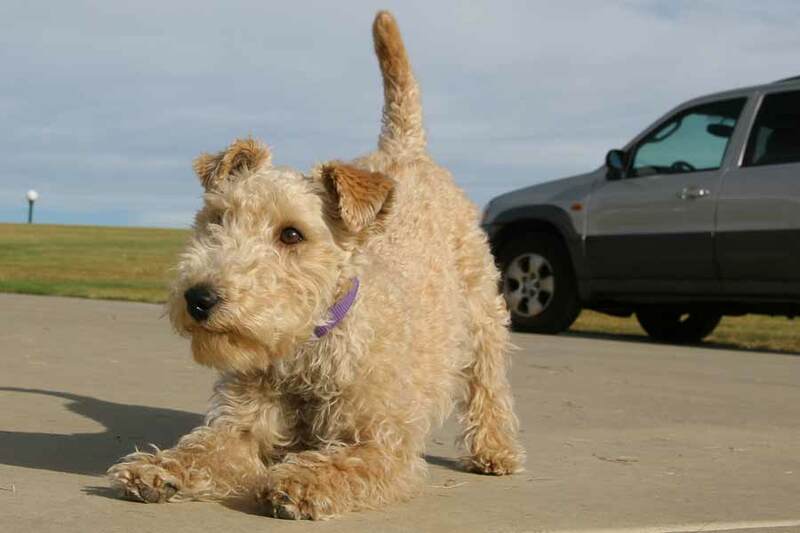 The Lakeland Terrier is bright and intelligent but is also independent and can be stubborn. Early training and socialization are important, but the training process can be challenging. Training should be structured yet fun, and the owner consistent and patient. The Lakeland Terrier dog breed needs an active, involved owner who understands the terrier temperament. Although usually good with children, this dog tends to bond more strongly with one owner than with the entire family. Lakelands are normally good with other pets in the family. The Lakeland Terrier is a healthy breed but can suffer from Legg- Perthe’s disease. Share your Lakeland Terrier story. Scroll down, fill up the form and attach your best picture. Note: Upload only Lakeland Terrier picture or your picture with Lakeland Terrier below - spammer's ip may be blocked. Dog Breed Standards is licensed under a Creative Commons Attribution-ShareAlike 3.0 Unported License.